White can visually expand a small space. Open legged furniture extends sight lines. Applying small kitchen decorating ideas to your tiny space will help it show better on the real estate market. Many buyers base their home buying decision on the size, style, and condition of the kitchen, so having a fantastic one is definitely a bonus. Unfortunately, many of us lack that spacious kitchen that will blow home buyers away. A small kitchen is definitely a disadvantage when trying to compete in the market place. Because tiny kitchens can look cramped and uncomfortable to work in, many buyers will walk away no matter how great the rest of the house may be. There are plenty of home staging tips and small kitchen decorating ideas that will help visually expand the space, create storage solutions, and make your kitchen more inviting to buyers. Color is one of the keys to successful decorating— it can work magic by visually expanding or shrinking space and raising or lowering ceilings. Knowing a few basic rules of color theory will guide you to make better color choices. Most people respond positively to light neutral colors, although there are successful powder and dining rooms in dark paint colors-- this is to make them appear cozy and intimate. But, since dark colors don't appeal to everyone, this isn't the best choice when selling your home. Your goal is to make your home appeal to the largest number of home buyers possible. Pale paint colors reflect and multiply light. Light colors will appear to push walls back. Dark paint colors absorb and deflect light making small spaces feel closed in. Cool paint colors appear to retreat, while warm colors seem to advance. Cool whites, creams, soft grays, greens, blues, pale colors in general, are all receding colors that reflect light, creating a feeling of spaciousness. Successful room designs will have a combination of cool and warm colors in the design palette, but one or the other should dominate. Warm, pale paint colors are great for kitchens. Accent warm wall colors by painting the trim white for a fresh, contemporary look. Nothing freshens a room faster than new paint colors. Many people put off painting because they're afraid of making a color mistake. So what! A can of paint is the cheapest and easiest way to instantly change your home decor. Always try paint samples on the walls before painting an entire room. Neutral color undertones are often hard to see until they're up on a wall. Check out color samples under natural and artificial lighting, as colors will change under different lighting. Incandescent lights will add a warm yellow cast to colors, whereas fluorescents add a cool cast. Halogen lights produce a white light with very little color distortion. Too much of one color can upset the harmony in a room. Kitchen cabinets painted the same light color as the walls will appear to blend into the walls, creating a greater feeling of spaciousness. Dark cabinets can create the illusion that a room is much smaller than it is. To create a feeling of maximum space, use the same light color palette on the walls, floors, cabinets, window treatments and trim work. Employ a light hand when adding pops of color, using no more than two or three colors in a tiny space. Introducing pattern and texture will bring life and movement to a small kitchen. Texture adds interest when light hits the uneven surfaces, bringing varying degrees of lights and darks of the same color. 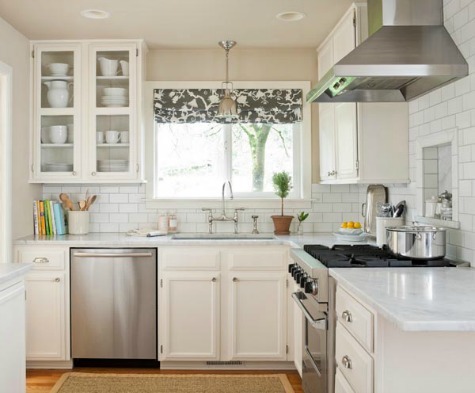 Don't overwhelm a small kitchen with too much pattern. Add pattern and texture to your small kitchen in the window treatments, accessories, chair cushions, flooring, area rugs or lighting fixtures. Not all at once, though! Vertical stripes on the walls or backsplash can elongate and bring movement to a room. Horizontal stripes on the walls or backsplash can visually raise a low ceiling. When using a monochromatic color scheme, select a monochromatic print of the same color. Swathing an entire kitchen in white will create a uninterrupted space without breaks of color contrast that prevent the eye from moving on. This home design tactic tricks you into thinking the space is larger than it is. Abrupt shifts from dark to light will trip the eye. An all white room can often be too intense, though. Punctuate the small space with spots of color using, kitchen accessories, artwork, fresh cut flowers, or live greens. A monochromatic, or low-contrast color scheme is the most successful color palette for small room designs. This style will create harmony, visual cohesion, and a sense of relaxation. This home decor style combines varying shades of one color in different shades, tints, tones, and textures. Any color can be used, but stick to neutrals, like whites, beiges, tans, or grays. Many people may yawn at the idea of a room that is designed around one color, but by incorporating variations in tones, textures, and accessorizing with glass, metals, objects from nature, and greenery, you can create a feeling of spaciousness and sophistication. 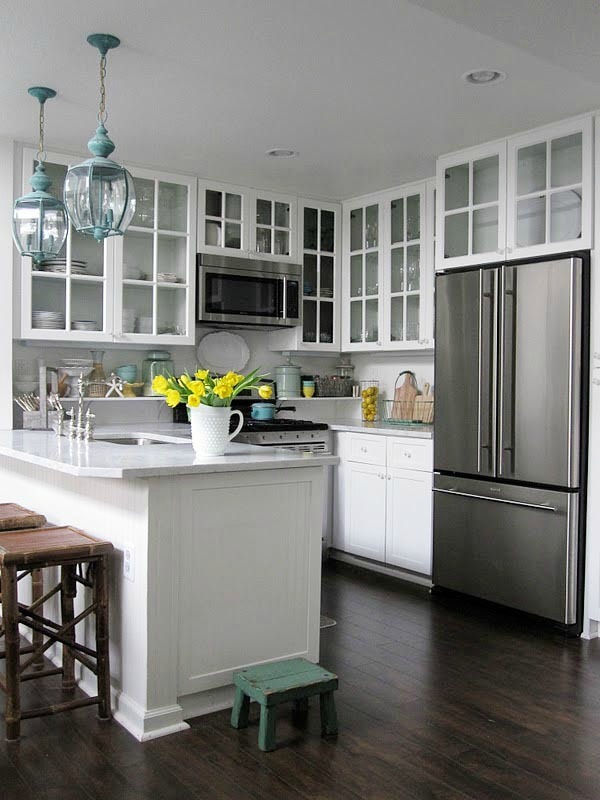 ﻿By swapping out some (or all) of the upper kitchen cabinet doors with glass, you'll create extra depth in your kitchen. Your eye will be pulled into the cabinets and to the back, making your kitchen appear more expansive by extending sight lines. Avoid using dark colored or opaque glass and be sure to keep the interiors nicely staged. Some small kitchen decorating ideas may include sacrificing a few upper cabinets and installing open shelving in their place. Open shelving reduces visual weight and adds extra depth by allowing your eye to travel all the way to the wall. Floating shelves are the most effective shelf style for home staging, because they take up less visual space than those with heavy corbels or ugly brackets. A great home staging design tip is to decorate shelves with objects the same color as the wall. When accessorizing open shelves, keep plenty of space around objects. This creates breathing room, which translates to that open, airy feeling. Focus on staging with a few standout accessories, rather then a collection of small objects, which can look cluttered. Follow the advice of HGTV interior designer, Sabrina Soto. "Never use an accessory smaller than the size of a grapefruit." Lots of natural light flooding into a room creates a feeling of airiness, translating into spaciousness. Keep window treatments minimal, or simply go without. Remove heavy or dark window treatments, which look oppressive and block natural light. 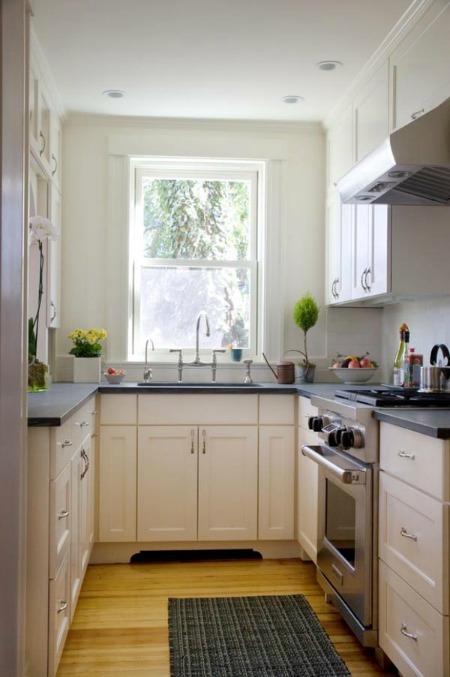 For a small kitchen lacking natural light, consider installing a large window. 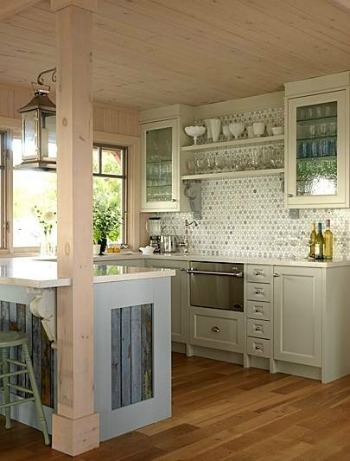 Extending sight lines to the outdoors will instantly make a tiny kitchen feel bigger. Or, install a skylight or solar tube to bring natural light in from above. 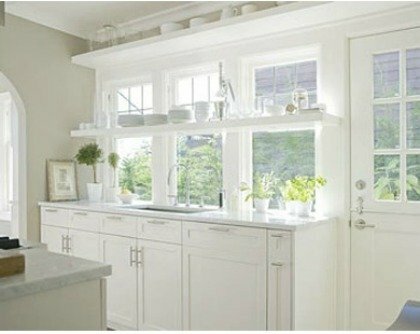 Hang a mirror opposite a window or where it will reflect a light fixture to scatter and bounce light around the kitchen. A kitchen with insufficient lighting is a depressing place to be. Who wants to cook in a dark gloomy space? Dark corners and shadowy recesses along the countertops will strain your eyes and make your kitchen seem smaller. A kitchen should have a good mix of natural, task, and ambient lighting. Consider adding under-cabinet lighting to flood the countertops with light. Under-cabinet lighting will improve the look, function, and safety of your kitchen. 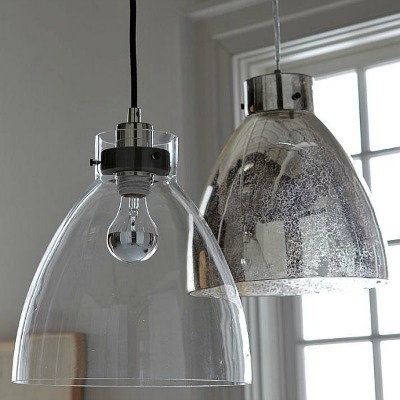 For task lighting, like pendent or track lighting, select clear glass or see-through pendent lighting to extend sight lines. House hunters love the ambience that recessed lighting provides. Recessed lighting is the answer for low ceilings, because the fixtures don't protrude down into the room. 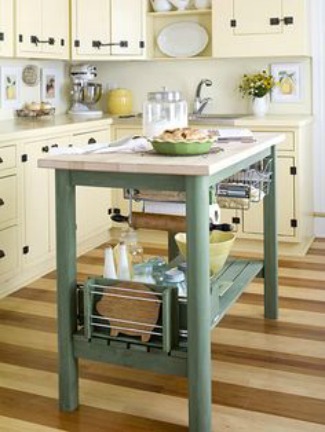 Use fewer pieces of kitchen furniture instead of many small ones to make a tiny space feel less crowded. Select furniture with a small footprint to reveal as much floor space as possible. The farther the eye can see into a room, the larger it will seem. Keep traffic areas clear of furniture. Furniture blocking the view into a room can also make it look cramped. Select low profile furniture for open concept rooms to keep sight lines open. For instance, in a kitchen/living room combo, use a sofa with a low back or an armless low-backed chair. In the kitchen, use bar stools without backs. Avoid cumbersome furniture with a large pedestal or heavy ornamental carvings. Instead, select furniture with open framework or features that allow you to see the floors and walls beyond. If you have room for a small mobile island, select one with an open framework that allows you to see through to the other side. For eat-in kitchens, consider a dining table with a glass top and open metal legs. Remove all the leaves from a dining table and place no more than two to four chairs around it. See staging the dining room. 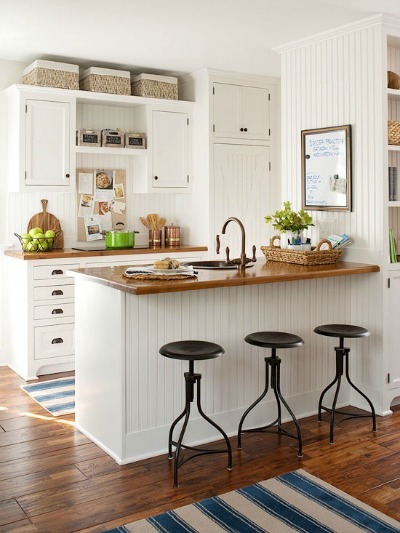 For island seating, choose backless bar stools that tuck neatly under the counter ledge. Remove or open up a section of a wall separating the kitchen from an adjoining room. It won't increase the size of the kitchen, but will bring in more light and extend sight lines. Simply removing a door can make a small space appear more roomier. Or, replace a regular door with a pocket door. Remove a door and widen the door frame to increase the sense of space. Avoid scattering small rugs around a tiny kitchen. It'll look cluttered and chopped up. Create a long path that the eye can glide along without interruption by painting wide horizontal stripes, oversized diamonds, or other elongated geometric patterns on the floor. This will "visually" widen the room. I don’t recommend painting the hardwood floors before selling your house, though, unless the color change is very subtle. An alternative to painting stripes is to place a long striped runner on the floor. Remember the warning about wearing horizontal stripes? That works for floors too! 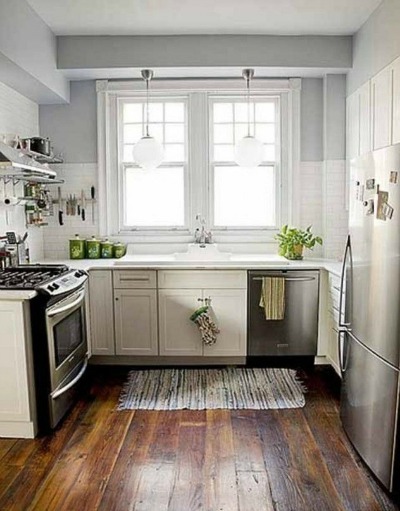 Light colored flooring will open up a small kitchen. Kitchen cabinets, walls, and floor in similar colors work in conjunction to "visually" enlarge a small space. To avoid abrupt color changes, link adjacent spaces with the same flooring, or at least the same color if floors are made of different materials. Use white or other pale color on a low ceiling to "visually" raise the space above. Drawing the eye vertically can make a room appear taller than it really is. If you have a low ceiling in your small kitchen, there are a few tricks you can employ to fool the eye. Kitchen cabinets that go all the way to the ceiling will create the effect of "visually" raising the ceiling, and as a bonus, provide more storage space! 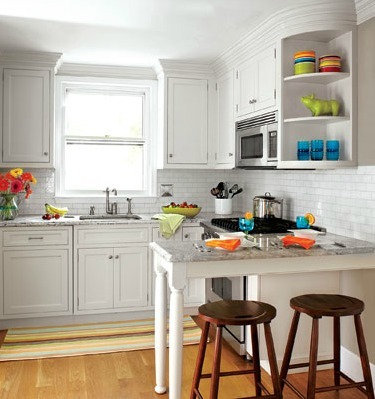 A less expensive option is to add accent molding to the tops of the cabinets to direct the eye upward. If upper cabinets don’t extend to the ceiling, a FEW well placed accessories, like large decorative plates, baskets, or framed prints along the tops of the cabinets can increase perceived ceiling height. When home staging, be stingy with accessories to avoid a cluttered look. Avoid stringing fake ivy above the kitchen cabinets as well— it looks messy. See staging the kitchen. Use objects with elongated patterns or shapes that direct the eye upward. Range hoods can be bulky and take up a lot of visual space. If you're planning on replacing your range hood, choose a streamlined or see-through model that takes up very little space. Or, do away with the need for a range hood by installing a cook top with built-in downdraft system. Storing stuff on kitchen counters shows buyers that you don't have enough storage! Removing everything from the kitchen countertops can instantly make your kitchen look larger! If you have viewers coming over, remove all but your prettiest appliance from the counter. 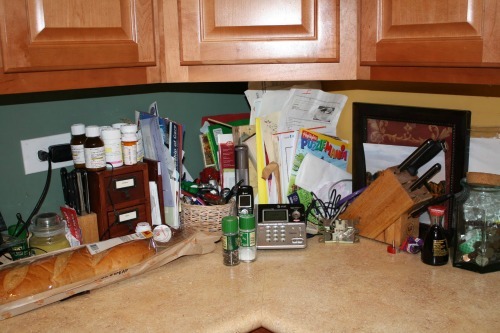 In super tiny kitchens, remove ALL appliances from the countertops. Keep one cabinet empty to quickly stash appliances inside when buyers are expected. Countertops aren’t the only recipients of overcrowding. 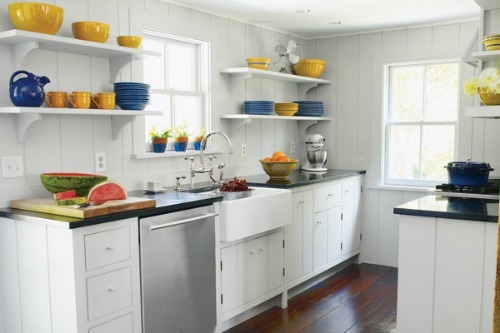 Windowsills, refrigerators and upper cabinet tops are also recepticals for clutter. Remove bulky butcher block knife holders from countertops. Reflective surfaces, like glass tile backsplash, stainless steel, sleek cabinets and shiny hardwood floors will illuminate your kitchen by amplifying natural and artificial light. A mirrored backsplash may seem like a “no-brainer,” but they're actually very “taste specific” and require constant cleaning. Instead, put up a light colored tile backsplash that'll reflect light and increase the feeling of openness in the space. Kitchen appliances should always match when you're selling your home. 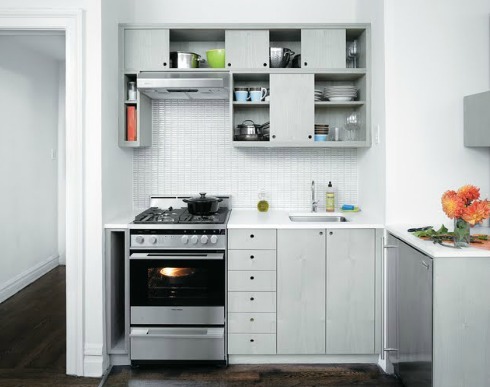 These days, you can find kitchen appliances that will accommodate any size kitchen. Gain a few inches of countertop by installing a 24” cooktop instead of a standard 30-36” one. You don't have room for a standard fridge? An under-counter model might be the solution. Make sure that the fridge fits flush with the kitchen cabinets. An huge fridge that juts out into the room just looks awkward and clunky. Microwaves can be built into cabinetry or hung underneath. Please don't leave a microwave sitting on the counter--it screams, "No room!" and takes up precious counter space. 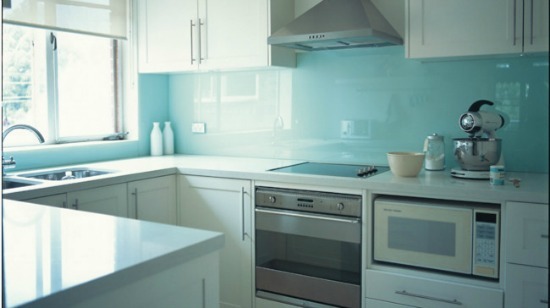 Kitchen fixtures should be simple and compact in a small kitchen. For small sinks, install an articulated faucet that bends out of the way to make room for large pots and pans. Or, mount faucets on the wall instead of on the sink area to provide more countertop space. If adding window treatments to a small kitchen, keep them the same color as the walls to avoid contrast in the space, or simply go without. Avoid complicated details, like ruffles, swags, and bows in your windows. Use valances or shades, or blinds—aim for a clean contemporary look with maximum natural light coming in. When accessorizing kitchen countertops, keep it simple and sparse. Avoid complicated vignettes with too many objects. Display a live plant, vase of flowers, or a bowl of brightly colored fruit on the countertop. During holidays, fill bowls with pomegranates or mandarin oranges. Fill a wire basket with natural colored eggs, or arrange a cluster of grapes to flow gracefully over the edge of your favorite bowl. Create a tempting vignette using elegant bottles of oil and vinagrettes in varying shapes and sizes on the counter top next to a small breadboard, bread knife, and a loaf of bread.